Egyptair flight MS804 transmitted a signal as it crashed into the Mediterranean Sea that could now help to pinpoint the wreckage, an Egyptian official close to the investigation said on Friday. “The device only operates when an aircraft strikes a hard object,” a source at the Egypt-led investigative committee said. He added that the signal was sent to plane’s manufacturer Airbus via satellites. 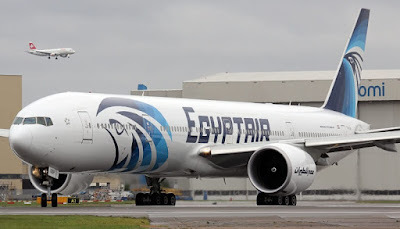 Airbus shared the signal’s location information with Egyptian officials, which helped narrow the search area to a 5 kilometer zone now being scoured by air and sea. The device is no longer transmitting, the official said. Searchers are racing against time to recover the A320’s two black boxes the cockpit voice and data recorders which would help shine light on what caused the plane to plunge into the sea last week. It led to the killing of 66 passengers and crew on board. The recorders’ underwater locator beacons only transmit ping signals for about 30 days, the typical duration of their battery life. A French ship specialising in underwater searches has arrived in the area of the eastern Mediterranean to join in the hunt for the black boxes. The ship, named Laplace, is equipped with three detectors supplied by the French company Alseamar, France’s civil aviation authority BEA said. Discussions were also taking place to include a deepwater robot in the search that is capable of operating at depths up to 3,000 metres, BEA said. On May 19, the Airbus A320 with 66 people on board vanished shortly after leaving Greek airspace en route from Paris to Cairo. BEA reported that smoke was detected on the aircraft shortly before the plane fell off the radar. However, it cautioned that the information which was sent automatically by the plane to ground stations did not point to a cause of the crash. Some body parts and small pieces of debris have been recovered.